HGST, which is slowly positioning itself at the upper end of the market as an enterprise storage specialist, has just released what it calls the fastest SSD on the market at the Flash Memory Summit 2014 in San Jose California. The new device uses a PCIe interface and delivers a whopping 3 million random read IOPS (512 bytes - sequential) and random read access times of 1.5ms. HGST managed to hit those performances using a combination of hardware and software improvements. It uses new, latency-optimized interface protocol proprietary to HGST, in addition to next-generation non-volatile memory components. The latter are 1Gb Phase Change Memory components built on a 45nm process, integrated on a full height, full length PCIe Gen2 x4 SSD card. HGST said its engineers worked with researchers at the University of California, San Diego to make the most of the new technology thanks to a new interface protocol and a low-latency interface architecture. Dr. Zvonimir Bandic, manager of Storage Architecture at HGST Research, said in a statement: "What is really exciting is to be able to deliver latencies close to 1us for small block random reads. This is something that just cannot be done with NAND Flash and current controller and interface technologies." 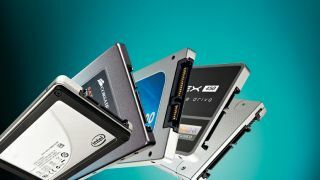 What are the top SSDs on the market?